The most important amber mine in the world is located in Russia, east of Kaliningrad in the Baltic region. This mine provides 80 to 90% of world amber and produces currently near 300 tons per year. Baltic amber is also found in Lithuania, Estonia, Poland and occasionally on the shores of Denmark, Norway and United Kingdom. Other provenances are the Dominican Republic, Myanmar, Lebanon, Sicily, Mexico, Romania, Germany, Canada and Australia. In these sources, amber is mined in the ground. Amber from Myanmar, ancient Burma, of pale yellow to red colour, was popular in China in ancient times. It was generally quite opaque except in its light-yellow varieties. 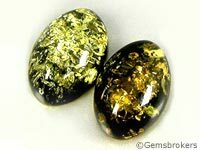 Amber from Sicily has quite dark shades and sometimes possesses green tints. The very rare blue amber from Dominican Republic brought in Europe by Christopher Columbus always came and still comes from rare and tiny exploitations. Its colour is due to aromatic hydrocarbon molecules included in the resin. Yellow amber from this country often contains inclusions of plants or insects living there 15 to 20 million years ago. Amber from Chiapas in Mexico, in addition to the classic yellow colours, can have tints of pink and green. Production for the state of Chiapas is evaluated to 5 tons per year. This production is almost entirely destined to local jewellery manufacturing. Amber from Lebanon possesses the oldest insects known embalmed in the resin 130 million years ago. Amber of Australia has been discovered recently on the peninsula of Capeyork. This source is dated from 10 to 35 million years. This amber, rich in vegetal and insects, allowed to develop researches of botanists and entomologists worldwide.